The original title of today’s feast was Our Lady of Ransom originally associated with the apparitions of Our Lady to St Peter Nolasco. She appeared to him on 1st August 1253 and showed him the white tunic and red cross to be adopted by the Order of Mercedarians which she wished King James of Aragon to establish. The purpose of the new Order was prayer and almsgiving for the redemption of Christian captives in Moorish hands. The apparition took place in Barcelona Cathedral where the Shrine of Our Lady of Ransom is to be found. When public devotion to Our Lady at Walsingham was revived after Catholic emancipation in the 19C, the feast of Our Lady of Ransom was chosen to celebrate Our Lady of Walsingham, as the older title of the Mercedarian feast had been Our Lady’s Dowry, a title that in the Medieval period referred to England when devotion to the Virgin Mary in England was particularly strong. It was believed that England belonged in some special way to Mary, who was seen as the country’s “protectress” and who through her powers of intercession acted as the country’s defender or guardian. This Holy House was built and a religious community took charge of the foundation. Although we have very little historical material from this period, we know that with papal approval the Augustinian Canons built a Priory (c 1150). Walsingham became one of the greatest Shrines in Medieval Christendom. In 1538, the Reformation caused the Priory property to be handed over to the King’s Commissioners and the famous statue of Our Lady of Walsingham was taken to London and burnt. Nothing remains today of the original shrine, but its site is marked on the lawn in “The Abbey Grounds” in the village. In 1896 Charlotte Pearson Boyd purchased the 14th century Slipper Chapel, the last of the wayside chapels en-route to Walsingham, and restored it for Catholic use. In 1897 by rescript of Pope Leo XIII, the sanctuary of Our Lady of Walsingham was restored with the building of a Holy House as the Lady Chapel of the Catholic Church of the Annunciation, King’s Lynn. 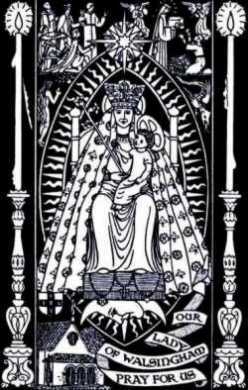 The Guild of Our Lady of Ransom, brought the first public pilgrimage to Walsingham on 20th August 1897. Visits to the Slipper Chapel became more frequent, and as the years passed devotion and the number of pilgrimages increased. On 19th August 1934, Cardinal Bourne and Bishop Lawrence Youens led the Bishops of England and Wales, together with 10,000 pilgrims to the Slipper Chapel. At this pilgrimage, the Slipper Chapel was declared to be the National Shrine of Our Lady for Catholics in England. The Shrine now attracts some 150,000 pilgrims during the pilgrimage season. O God, Who for the deliverance of Christians from the power of the pagans, graciously willed to enrich Your Church by a new religious offspring through the most glorious Mother of Your Son; grant, we beseech You, that by the merits and intercession of her whom we piously venerate as the founder of so great a work, we may be delivered from all our sins and from the captivity of the devil. Through the same Jesus Christ, thy Son, Our Lord, Who liveth and reigneth with thee in the unity of the Holy Ghost, God, world without end. R. Amen. Blessed and venerable are you, O Virgin Mary, who, without spot to your maidenhood, were made the Mother of the Saviour. V. O Virgin Mother of God, He Whom the whole world does not contain, becoming man, shut Himself in your womb. Alleluia, alleluia. V. After childbirth you still remained an inviolate virgin: O Mother of God, intercede for us. Alleluia. Hail, Mary, full of grace, the Lord is with you; blessed are you among women and blessed is the fruit of your womb. We have received help for our salvation, O Lord; grant, we beseech You, that we may everywhere be protected by the patronage of blessed Mary, ever virgin, in whose honor we have made these offerings to Your Majesty. Through Jesus Christ, thy Son our Lord, Who liveth and reigneth with thee, in the unity of the Holy Ghost, ever one God, world without end. R. Amen.